Fiddlesticks players rejoice, the not-so-scary scarecrow is finally being buffed next week in Patch 8.4, according to the current PBE cycle. He’s been under-performing for months, well beyond the start of the preseason and new rune system in November. While the new runes helped out other junglers that had previously fallen off the earth, such as Udyr and Kindred, Fiddlesticks didn’t really benefit from them at all. His largest problems aren’t his damage or his teamfighting ability. 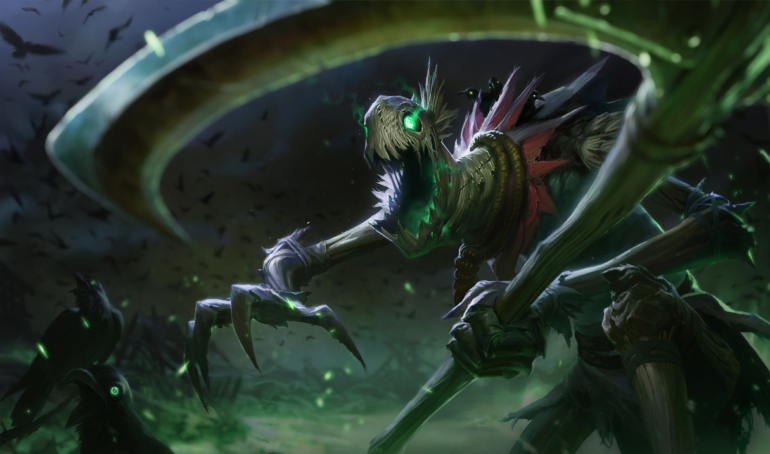 After all, Fiddlesticks can deal some insane damage and the crowd control he dishes out in ganks is nigh unparalleled. His jungle clearing is where he falls short. He can stay healthy against big monsters like the Blue Sentinel and Red Brambleback, sure. But when he has to hit more than one monster, like against the wolves or raptors, he falls apart. This buff aims to fix that. His Dark Wind—the super annoying crow that bounces off enemies—will now deal double damage to monsters, greatly increasing the speed at which he can clear camps. Right now, this ability deals 50 percent more damage to monsters, so this will be a significant ramp up. Its cooldown is being lowered as well. His ultimate ability, Crowstorm—that’s the one with lots of super annoying crows—is also getting a slightly lower cooldown, which will help his presence in teamfights, too. All three of these buffs should arrive with Patch 8.4 next week.